Classically, Clear Quartz stones are thought of as colourless, candle-shaped hexagonal prismatic crystals with relatively smooth sides and naturally facetted terminations at one or both ends. Quartz can occur in numerous other growing habits, including compact or concretionary masses and fibrous forms, as well as microcrystalline Quartz, which is not prismatic. Clear Quartz is sometimes called ‘Rock Crystal’, and is the stone most often thought of when the term ‘Quartz’ is used. The name comes from the Greek for ‘ice’, and some of the ancients believed that Quartz crystal was water frozen so hard it could never thaw. 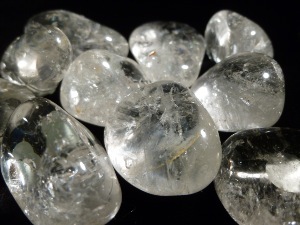 Clear Quartz has long been the subject of spiritual beliefs and folklore. The Japanese called called clear Quartz ‘the perfect jewel’ and viewed it as a symbol of infinite space, purity, perseverance and patience. 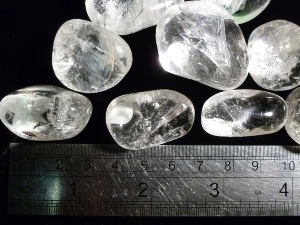 Indigenous cultures in both North America and Burma have believed clear Quartzes to be living entities and presented them with food as ritual offerings. Crystal balls brought back by the Crusaders were said to posses magical powers. Clear Quartz is considered emotionally neutral, but it may amplify any emotion with which it moves into resonance. It may bring a clarity of thought and purpose to one’s mind and heart and may also assist one in overcoming confusion. Clear Quartz is said to amplify the energies of any other stone and may be used to make the energies of smaller stones more easily felt. Clear Quartz crystals form in many areas around the world, and it’s believed each location lends its particular energies to the crystals. These properties will be listed with each stone that has a location stated with it. Quartz tumbled to a smooth finish, an ideal pocket size stone, small enough to carry around with you. Tumble Stones can also be placed around the home for their energies or can just be nice decorative items. Quartz crystal gemstones of varying sizes selected specially for your order.